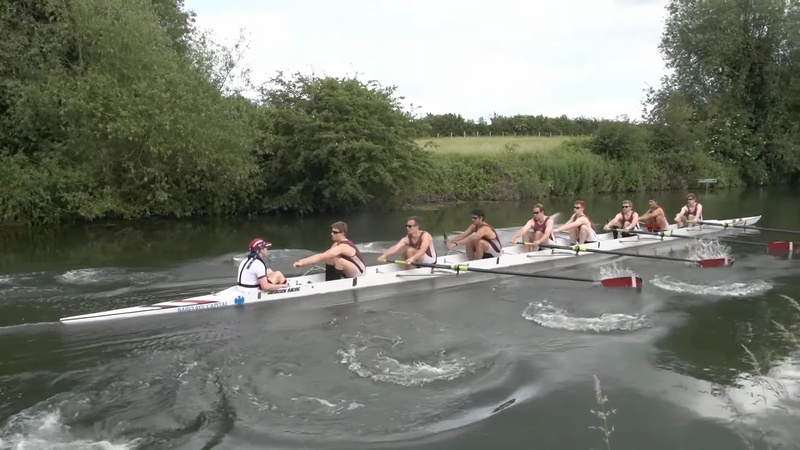 If you’re looking for a crew photo, it is possible to extract one from Oarstack video on YouTube. Results will vary, but they can be OK, like the frame below from this video. Click the images for larger versions. 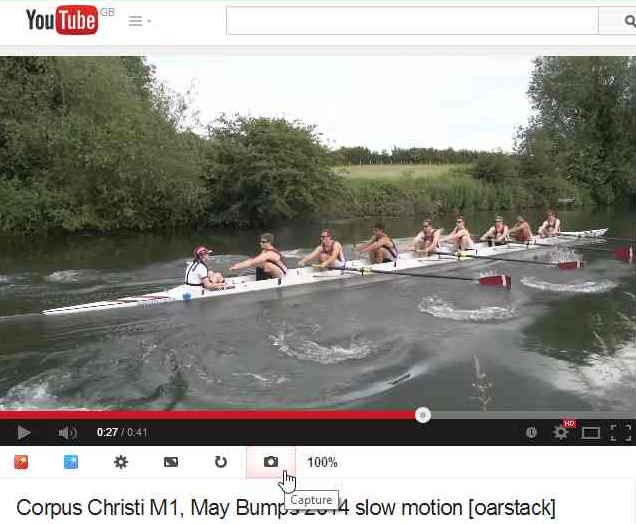 At the time of writing I’m using the Magic Actions for YouTube extension with the Chrome browser to extract frames. Plugins can turn into a security risk, so you’ll need to satisfy yourself that it’s still safe. If you’re happy and have the extension installed, first adjust some settings. If the extension is working you’ll see its icons below YouTube videos. Click the settings one as shown below. Most of the settings don’t matter, but the resolution should be set to the same as the source video, which for Oarstack is usually HD1080p. Setting the player type to HTML5 will activate the slow playback features, which will be handy for choosing the right frame. 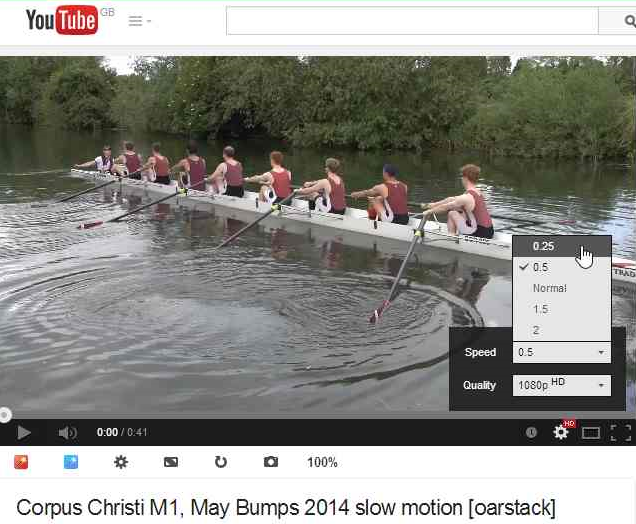 Then find your chosen video – this is our example – and set the playback speed to 0.25. This will make it easier to choose a good frame. Drag the slider to somewhere just before the area you’re interested in. Play the video and try to pause it at the right frame. If you miss it, drag the slider back and try again. When paused at the right frame, click the Capture icon. This will take you to the capture page. It’s worth experimenting with the sharpen filter if the image is soft. Click the save button when done. You should now have a 1920×1080 image, a bit like the one below. Video compression will produce artefacts in the images. These will be at a minimum when there’s not much ‘going on’, or not many rapid changes to compress, at that point of the video. Most Oarstack slow motion video alternates between real frames that the camera captures, and interpolated frames that the software generates. If some frames are interpolated the description will say so. Interpolated frames tend to have more artefacts than the real ones. 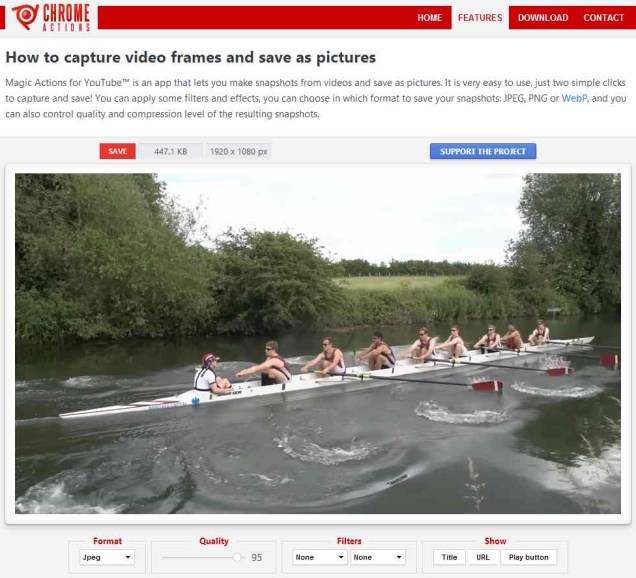 Oarstack video is taken with a fast shutter speed – usually 1/1000s or faster – to aid generation of slow motion using frame interpolation. This is unusual, and makes the video look jumpy when viewed at full speed, but is good for grabbing frames. Other YouTube videos might not give such good results. 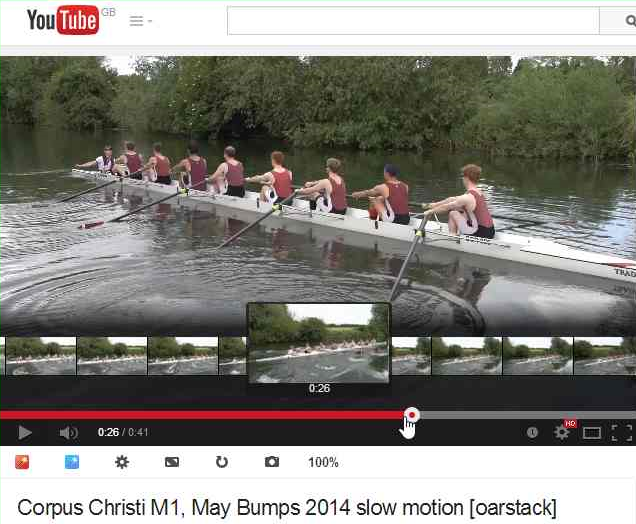 Oarstack video and images can be used freely for personal use. Extras: http://youtu.be/BdRtePblWZQ, also available as a high quality download (752MB) http://goo.gl/D1ku14 and below. 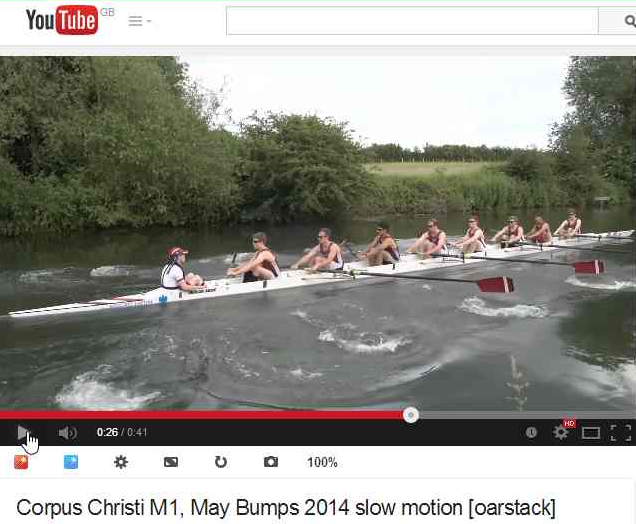 This completes the coverage for the May Bumps 2014. 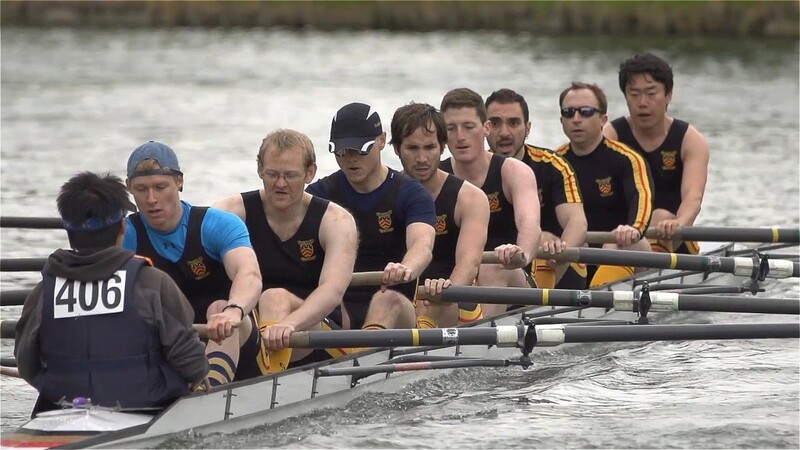 Follow Oarstack on Facebook or Twitter for future events. The camera is booked, and the plan is to record the six lower divisions on Wednesday, and the top four on Thursday. 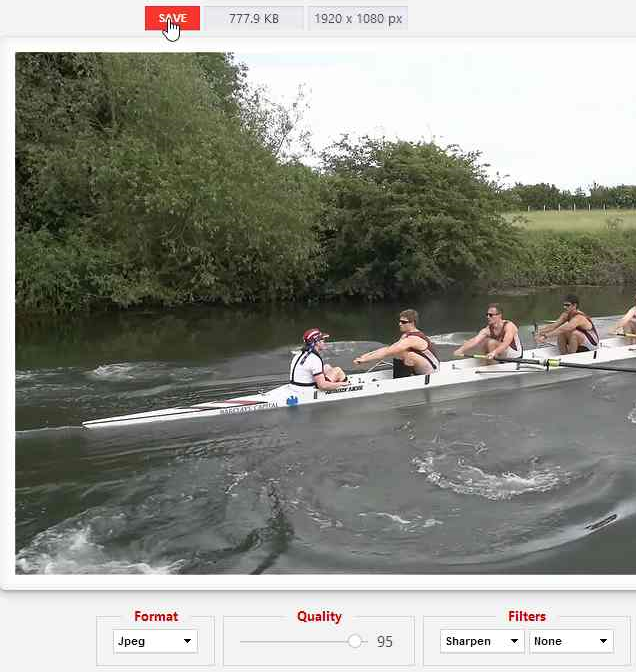 The camera will be just upstream of the first start position, same as usual.